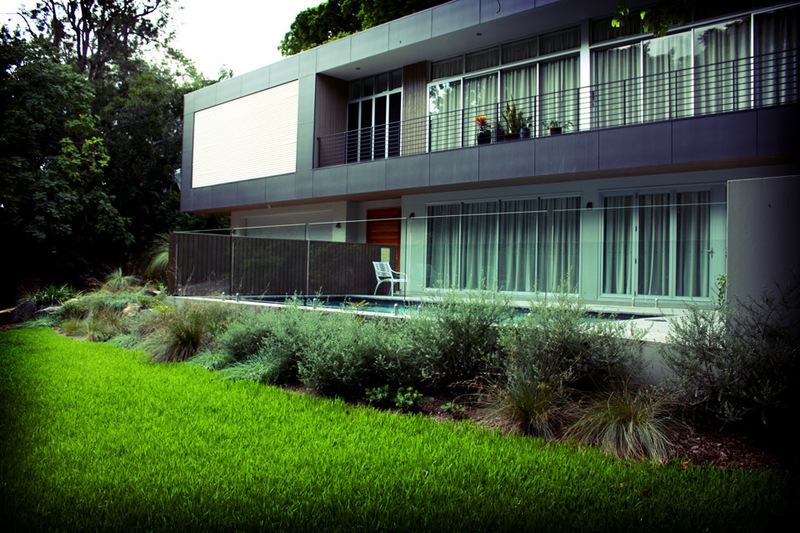 Design-led water management for a modern home on a steep block. This luxurious 3500m2 property in the inner city suburb of Red Hill in Brisbane resided on a battle-axe block, surrounded by other residences. The site retained a steep slope and a water course easement through the property. There were overland flow issues from neighbouring properties that required water management. 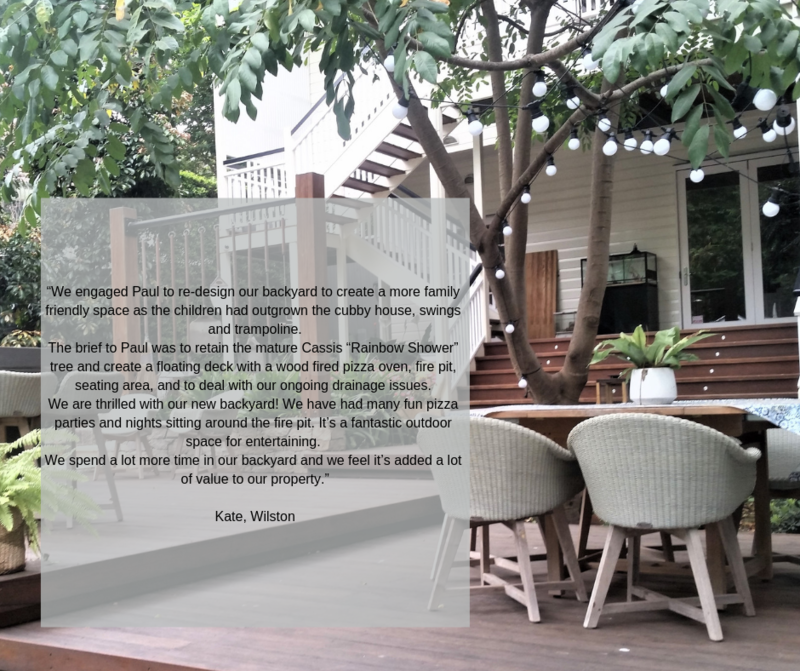 We were excited to solve these issues while complimenting the new modern home on the property and the environmental requirements of our green-minded clients. A large turfed space opened the yard and gave ‘breathing’ space from the towering trees to the neighbours' boundary. A sloped turfed zone also combatted against the worst area for erosion and provides a fun play area for the kids to roll down. We stopped the turf where the maintenance would get too difficult, removing the requirement to mow on a slope. 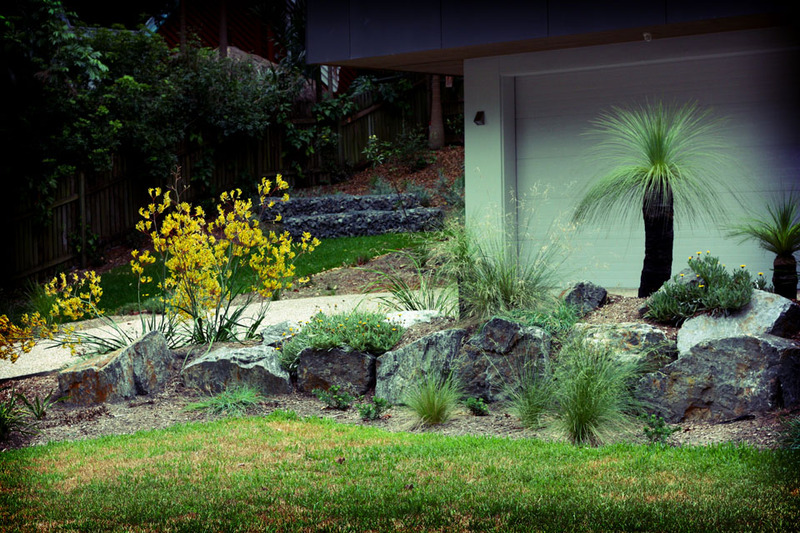 Native and indigenous planting was chosen in keeping with the importance of environmental sensitivity for the property, as well as attracting fauna. 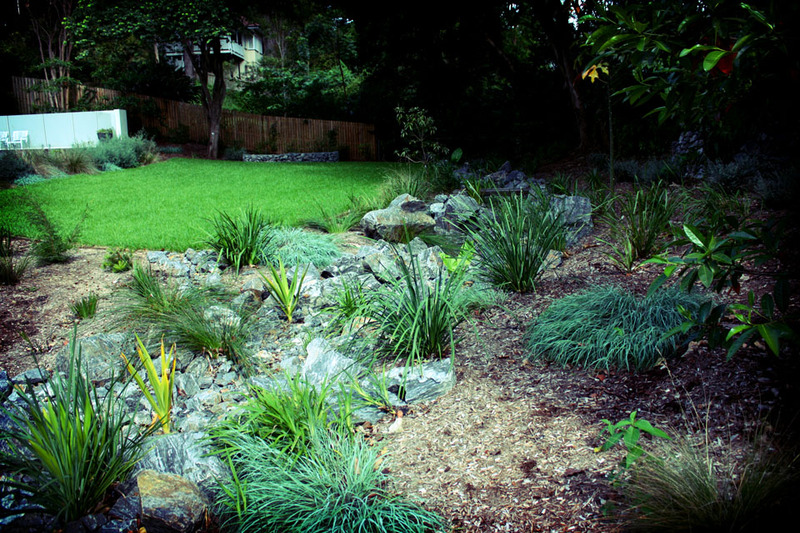 Grey-green foliage plants contrasted with the lush green planting, and imitated the grey tones of the building and dry creek bed. Tall trees were used to screen neighbouring properties and to frame the building. 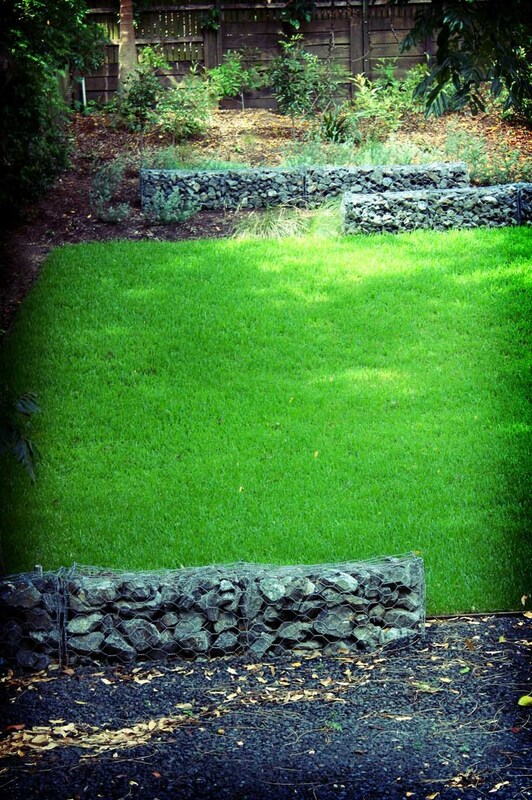 Stabilizing grasses and groundcovers were chosen to aid in erosion control. Water flows from the surround land through the ‘gully’ of the property during heavy rains, causing erosion and flooding of the driveway. 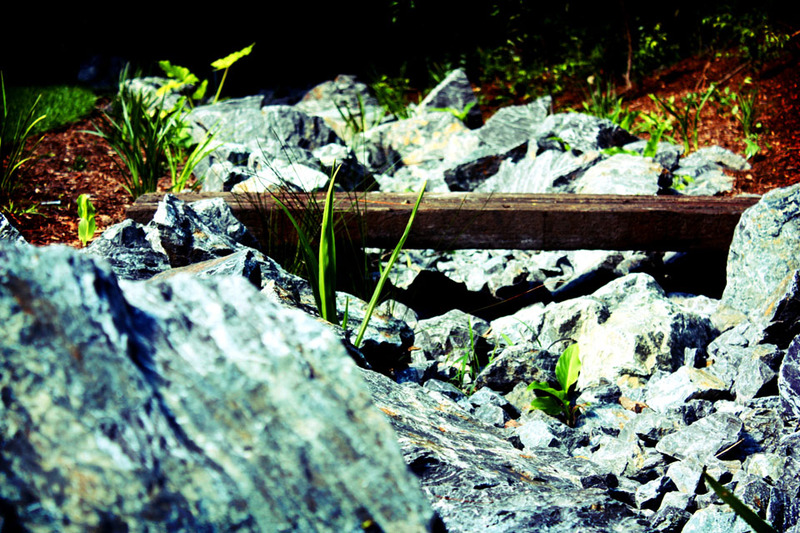 We chose to use bluestone rock for the easement, to compliment the existing highly visibile bluestone wall on the boundary of the property. 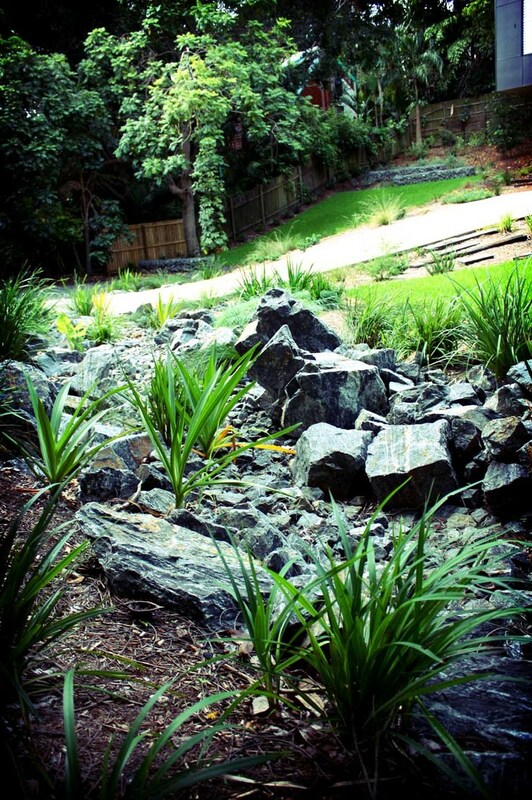 The bluestone was quarried from a local site - the local material reducing the environmental footprint of the project. The rock colour also matched the colouring of the building and the angular shape complimented the modern architecture. 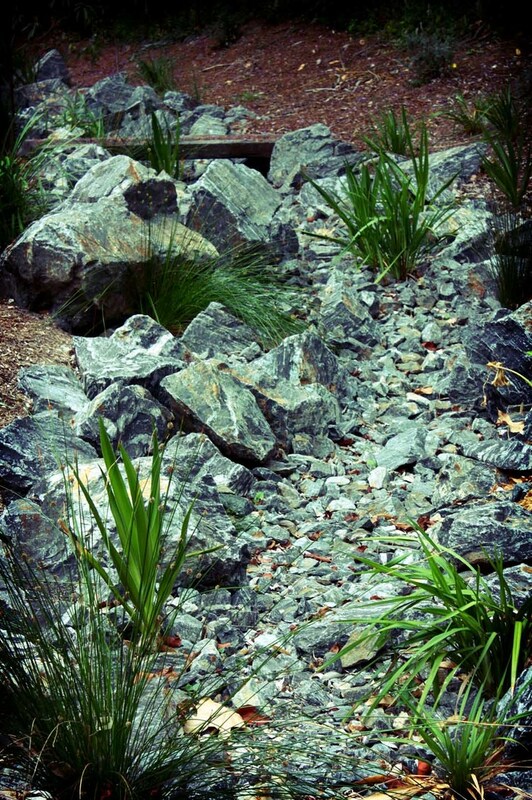 We used the bluestone rock in gabion walls (feature and retaining), and gravel-sized for the visitors' car park. 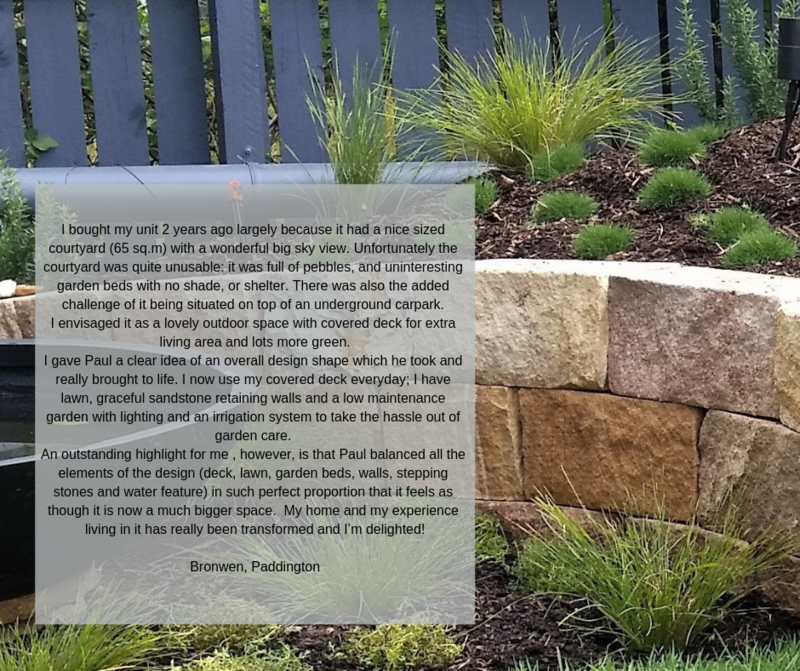 Large boulders were used as retaining walls. Extra large boulders brought a sense of scale to the large block. 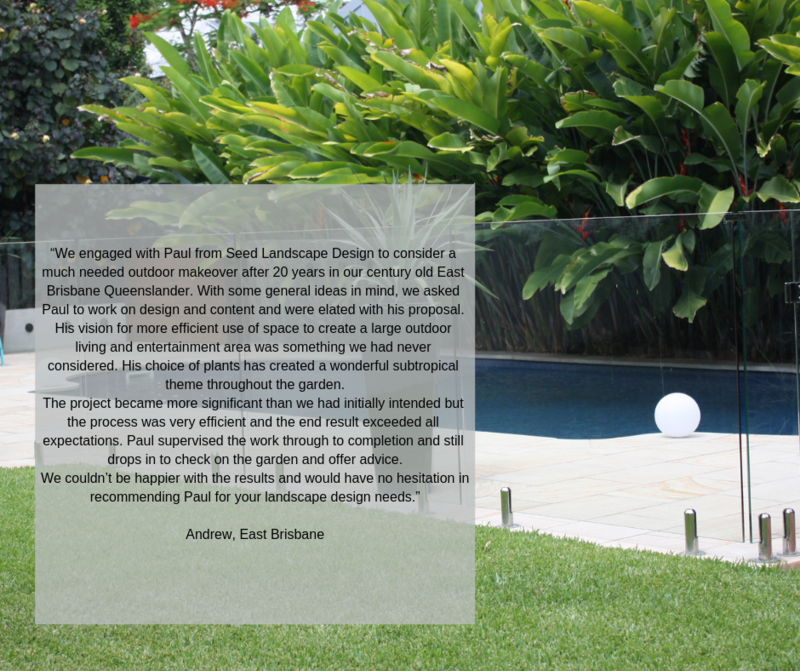 The pool fencing required special treatment as it was to the front of the house. We chose frameless glass to two parallel sides, allowing views from the building through to the landscape and gardens beyond. A timber screen at the end of the pool provided privacy between the pool and the building entry. Timber used in the building was replicated and linked the landscape to the building. Grey granite tiles married with the building and feature rocks. 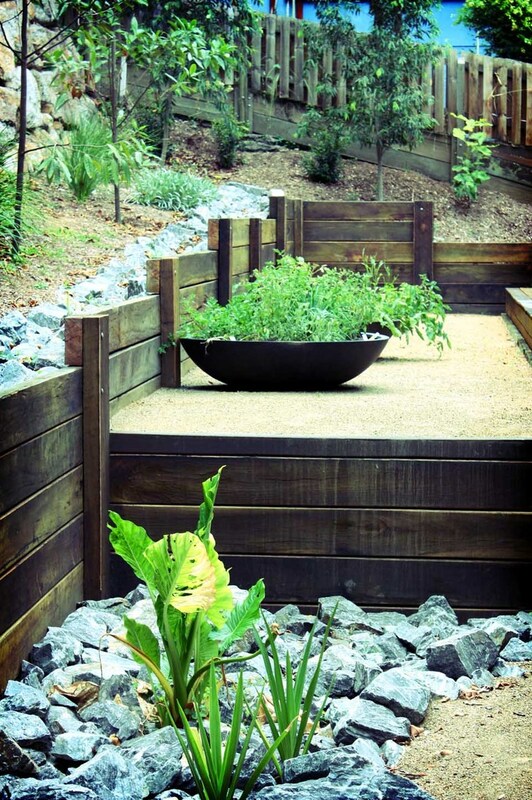 Recycled railway sleepers were used as steppers and stairs and a sandpit for the kids. We also used sleepers to create a bridge over the creek bed.